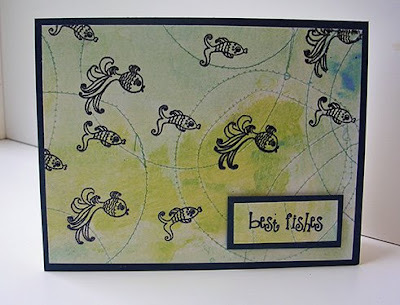 Have you ever just pulled out some patterned paper and played around with it? Usually, I start with either a specific occasion or a specific stamp I want to use. Then I choose pattern paper or cardstock to get the color scheme. Then I play around with a layout. 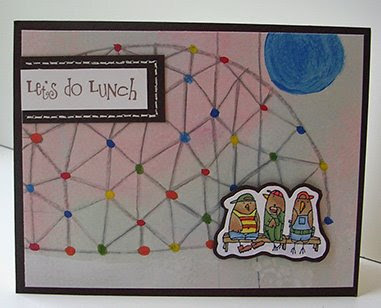 Well, Johanna sent the design team some Daisy D Wonder Years paper created by Stephanie DosReis. I decided that I would do my usual process backward and start with the paper. 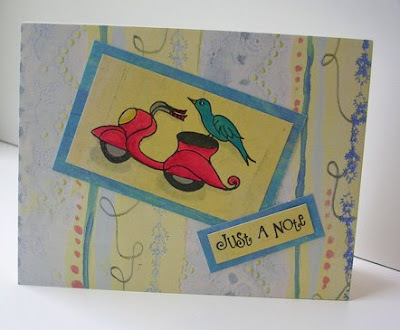 The Wonder Years paper has all kinds of eclectic nooks and corners that you can snag to make a card. For this first one, I picked out the penciled Monkey Bars and then decided the 3 pipers on a bench should have their lunch sitting in front. 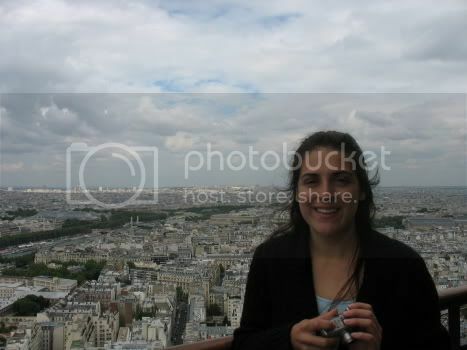 For this one, I liked the colors and the stitching. But I chose the stamp just because I love it. 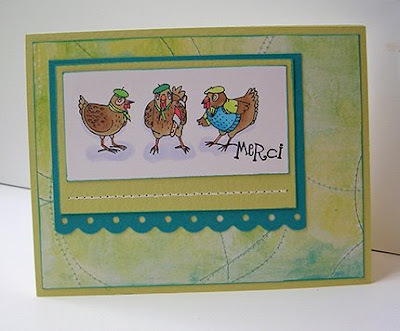 Its called french hens with berets - the middle guy has a loaf of french bread under his wing (LOL!) and you gotta love the berets. Then I decided the stitching looked like bubbles - so I embossed Michelle and Gaston swimming about. 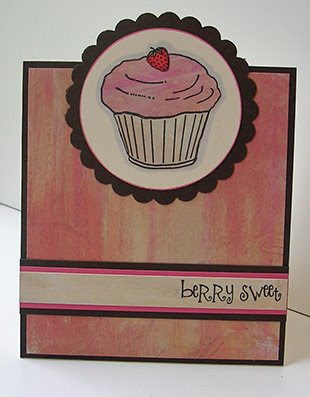 Here, part of the paper looked like yummy strawberry frosting, so I paper pieced strawberry cupcake. (I love strawberry cupcakes - if you've never tried them you are missing out. Just grab one of those cake mixes and cans of strawberry frosting at the grocery store. I think its the red dye #5 that makes it all extra yummy). Here is Annebelle on a scooter - racing past a lacy background. 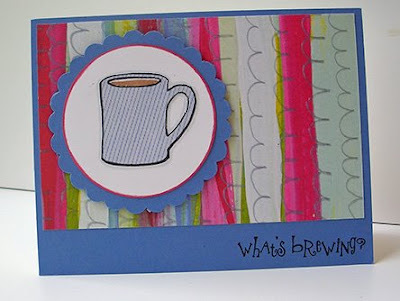 And last is a cuppa joe - paper pieced (using mug large) from a fabric cloud on one of the papers. So here are my attempts at playing with patterned paper. It was interesting to start with the paper and then go from there. So how do you design? What do you start with? The stamps? The occasion? The color? The paper? Love all of these but I'm particulary fond of the one using the Annebelle since it's so close to the name of my daughter, Annabelle. A whole bunch of great cards! As for your question: "So how do you design? What do you start with? The stamps? The occasion? The color? The paper? "- well, I guess for me it's all of the above- just not in the same card, lol! I love them all. You did great with the papers. They're all wonderful and I refuse to pick a favorite. I like to change things up and sometimes start with the paper, other times start with the stamp/sentiment.